This is a delightful large, bushy evergreen. 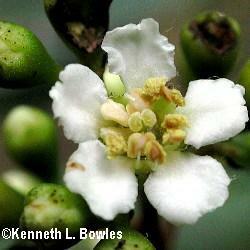 It produces white flowers in the summer and red berries in the winter, just in time for the Christmas season. It is a very popular and well-tried landscape plant with great versatility. Use it as a foundational plant in a native perennial garden, as a hedge, screen or at the back of a border. It can also be pruned and some are available at our nursery pruned to a single, standard trunk. The sight of a standard Toyon crowned with its profuse red berries in winter is very eye-catching. It is fire resistant if it gets watered every 2 weeks during spring and summer. The berries are edible but are bitter... it's best to let the birds to enjoy them. Pretty evergreen bush. One of the few things in my native-scape that stays green when most others are going stress deciduous. White flowers, with nose very close, smell like something dead. But they are loaded with native bees in summer and even attract big scary wasp occasionally.